The one major English Language motion picture depicting contact between Rome and China, Jackie Chan and John Cusack's ahistorical Dragon Blade, which proves that in LA a historian should say anything or they would be better off dead. Nonetheless the “Geo-political” drama of the movie is focused on the Silk Road and trade and profit between East, West and various middlemen. Colonial and antebellum America was nothing if not Roman in it's outlook. Only America and Rome have a Senate. The first army the United States raised after the Constitution was comprised of combined arms units called legions and both empires have a thing for Eagles as a symbol. Thomas Jefferson's goal for the Lewis and Clark expedition was the Pacific, and specifically a good place for a port on the West Coast. Two wars with Mexico gave the backwards looking South Texas to enjoy, but the North wanted California and it's harbors. Just before America finished it's cross continental project of subjugating Mexico, England injected itself into China's markets with a dose of cordite and morphine, gaining themselves an extra-territorial lease on Hong Kong. America threatened war with England over ownership of Oregon. However, as soon a fleet could be harbored on the Pacific Coast, Mathew Perry circumnavigated the globe with coal, steel and DuPont gunpowder to demand access to Japanese markets. With the exception of two wars with Germany brought on their interference with Atlantic shipping, all of America's foreign wars have been about access to Asian markets at American advantage. War with Spain may have gained the US Puerto Rico and Cuba, but Arthur MacArthur and his famous son spilled more blood and made their homes in the Philippines. The war with Vietnam ended not just with the fall of Saigon, which was a forgone conclusion, but with Kissinger and then Nixon finally striking a commercial bargain with Chinese Communist Party, one that endures to this day. Bismark's vision of a world order built on German industry's exploitation of Russia as a resource state collapsed into a pit of Blood and Iron that shook the world and killed 10 million terrified teenagers in a stalemate any European general could have foreseen by studying the American civil war rather than the campaigns of Napoleon. World orders are built on trade arrangements which deterministically result from geographic accidents. China is difficult to reach. China has always sought to keep it's economy as closed as possible. When confronted by the foreign commercial interests, be they Roman, English or American, China expects to be paid in cash. Kissinger's world order makes American orientation towards trade with China possible by putting oil, rather than gold and silver, at the center of the world economy. Kissinger's deal with OPEC, getting the latter to only accept dollars in exchange for petroleum, happened at the same time that friendly diplomatic and commercial relations restarted between the United States and China. China's oil consumption is much greater than it's production. China exports products to the US and finances the US government's debt in order to buy more oil, which it then burns faster than Congress burns dollars. 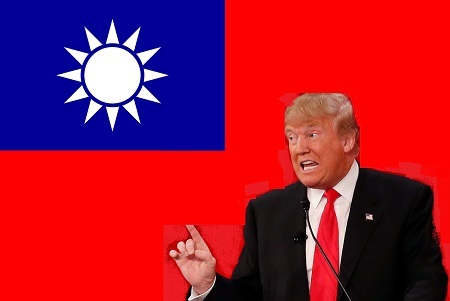 Trump's recent phone call to Taiwan, orchestrated by Bob Dole, is a direct threat to China. The rulers of China see Taiwan as a breakaway province rather than a nation. The United States, while gleefully selling arms to Taiwan, is deliberately ambiguous on the question. Chinese markets are now and always have been more important. China's recent fortification of the Spratly islands, which exist in a potentially oil rich area, and seizure and return of an American naval drone were a clear message to America elites “Hey Neighbor! Stop your dog from shitting in my yard!” American elites heard this loud and clear. What was heard even louder was China's threat to re-open anti-trust investigations against General Motors for their joint venture with Shanghai Automotive, which sells 3.5 million cars in China yearly. A whisper in Taipei's ear was answered by a boot in Detroit's crotch. The center-right Democratic Party will spend four years flogging Trump with his Russian business ties to keep his ego distracted. They will have little time for opposition to his domestic policies until fresh rhetoric is needed for the next election cycle. In a centuries long imperial project the well being and comfort of one or another group of subjects is immaterial. Clinton is a friend, protege and consulting client of Kissinger and should she ever fall from the tree she will not bounce far. Should Trump threaten to actually upset this quarter millennium of imperial progress and cooperation he will be sidelined by the rest of the elites with an impeachment ballot or hollow point bullet. A dozen thin justifications or explanations could be manufactured for either. America will then get used to President Pence while there are more calls for national unity and reconciliation from Democrats as the domestic policies supported in public by the Republicans and private by the Democrats continue unabated.